When Louis XIV died in 1715 AD, his great-grandson Louis was only five years old. First his uncle Philippe, then his teacher Cardinal Fleury, ran the government. Both these men saw that more and more people in France were getting interested in Enlightenment ways of thinking. How should the Enlightenment change France’s government? They tried to figure it out. Philippe moved towards freedom of the press. He started a national bank and printed paper money, though this ended up causing money problems. Fleury fixed the money problems. But to save money he let the French army fall behind England’s army. The British prime ministers forced France to stop trading with India. Fleury modernized France’s roads and canals. But he did it by forcing farmers to work on the roads without paying them. 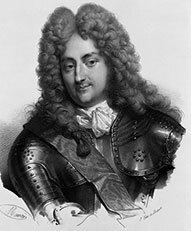 When Fleury died Louis XV was 33 years old, and he took power for himself, ruling together with his girlfriend, Madame de Pompadour. Louis immediately went to war with Austria and England, fighting over who would control North America. The war with England went badly, and France fell deep into debt again. 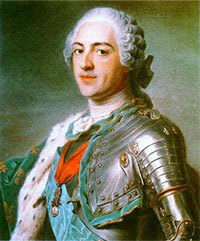 Louis made an alliance with Maria Theresa of Austria instead of fighting her. 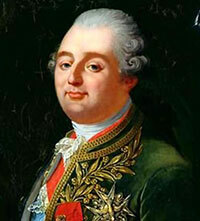 When Louis died of smallpox in 1774, his son had already died, so power went to his 20 year old grandson, Louis XVI, who was married to Maria Theresa’s daughter, Marie Antoinette. By 1774, people in France were beginning to see that the Enlightenment didn’t just mean modernizing the government. It meant changing the government so that rulers would be elected instead of chosen. Like his mother-in-law in Austria at the same time, Louis tried to change. He supported the American Revolution in 1776. He took small steps to democratize French government. And he allowed freedom of religion, and freedom from torture (except for enslaved people he shipped from Africa to the Caribbean). But modernizing the country and paying for wars meant that Louis also had to raise taxes. People were angry about the taxes, and they wanted much more political power – and the American Revolution showed they could get it. In 1789, the French Revolution started. Cite this page: Carr, K.E. Louis XV and Lous XVI of France. Quatr.us Study Guides, August 5, 2017. Web. April 23, 2019.